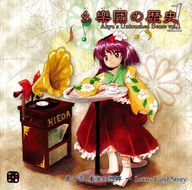 History of Yougakudan 1 ~ Akyu's Untouched Score vol.1 (幺樂団の歴史１ Akyu's Untouched Score vol.1, Yougakudan no Rekishi ~ Akyu's Untouched Score vol.1) is an official doujin album by Team Shanghai Alice released on 2006-05-21 (Reitaisai 3). It is the first volume of the Akyu's Untouched Score collection, presented by Hieda no Akyuu. It contains the full soundtrack from the fourth PC-98 game Lotus Land Story, as heard in Mystic Square's music room. This particular album has two CDs due to the huge amount of tracks, as well as two extra tracks (no. 29 and 30 on Disc B) that aren't heard in the original games. For comments on the original music, see Lotus Land Story/Music. History of Yougakudan "Touhou Gensokyo ~ Lotus Land Story"
This is a history of Yougakudan from the collection of Hieda no Akyuu. This first volume is the soundtrack of Lotus Land Story. It's not an ordinary soundtrack, though; the musical voices I had to use for sound effects in the game are now free to let the music flow forth at full power. Now, about Hieda no Akyuu - she possesses the capability of not forgetting things seen once, and she's a bit strange for a human, but she's a good person. Really. Because she knows about Yougakudan. This page was last edited on 11 April 2019, at 07:47.